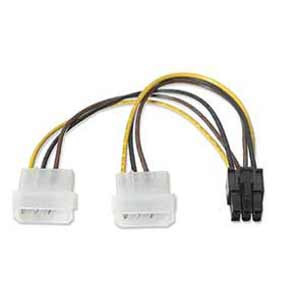 Hi, has anyone made their own Molex to PCI-E Adaptor? I cant find any wiring schematics or specifics on the PCI-E end, nor can i find any pictures sufficient to clue me in to what is needed where. If anyone has pictures of a store bought adaptor or schematics or just some good info I would really appreciate it. Im not the most electronically inclined person around so any help with this would be appreciated. After looking at many pictures of these adaptors, I have come to reason that the clip side on the card needs 3 black ground wires from powersupply. The other side 3 12v yellow wires from powersupply. I have read through some powersupply info and it seems that they put their pci-e power connectors on different rails so it doesnt require its own, and there is no standard for how this is done (so it shouldnt matter). This should be easy enough to make if anyone can confirm or refute my observations i would feel alot more comfortable actually using it. Hello cybrsamurai. Cool name. Here is a diagram showing PCI Express Video connector pin layout.